It’s not often that I write about purely instrumental music, but I just could not let this one go without a good review. Suspended in Light might have it’s weak spots here and there overall, however, the combination of the beautiful piano melodies and occasional violin contributions all dressed up in some modern enchanting electronic sounds seem to work just perfectly. So if you are looking for something to keep you company throughout the long workday, Lyndsie Alguire‘s compositions might just be your answer. If you already decided to give Suspended in Light a chance, you can find your free download and even more information on the artist on the Camomille Music‘s website. And when the netlabel starts off by saying things like “With the right amount of chance, sometimes you fall upon wonderfull people creating equally wonderfull music. It’s the kind of encounter that makes having a netlabel worthwhile,” you should already know you are in for a real treat. What makes this 15-track album truly special is Lyndsie’s piano work which, above anything else, seem to emanate with pure positive take on life. With the sweet optimistic melodies the songs might just turn your average gray day into a day that made you dream again. So don’t waste any more time and take a listen, but if for any reason you still feel like taking the album for a little test drive before the final ‘download’ commitment, be sure to check out to the three of my favorite tracks, Dawn Goes Down, How to be Still, Suspended in Light, and Syncopation. 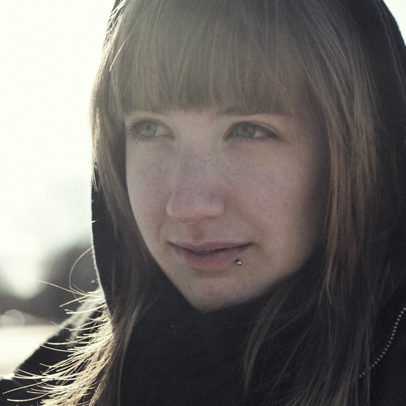 Lyndsie Alguire is currently based in Montreal where she continues on the path of an exciting musical career. With her classical piano training started at a young age, it comes with no surprise that her compositions seem light, effortless and, at times, even flawless. Although Lyndsie started writing her own music when she was only 13, it was not until later on than she discovered the magic of combining classic with modern, and started to experiment with electronic sounds to spice up her repertoire.